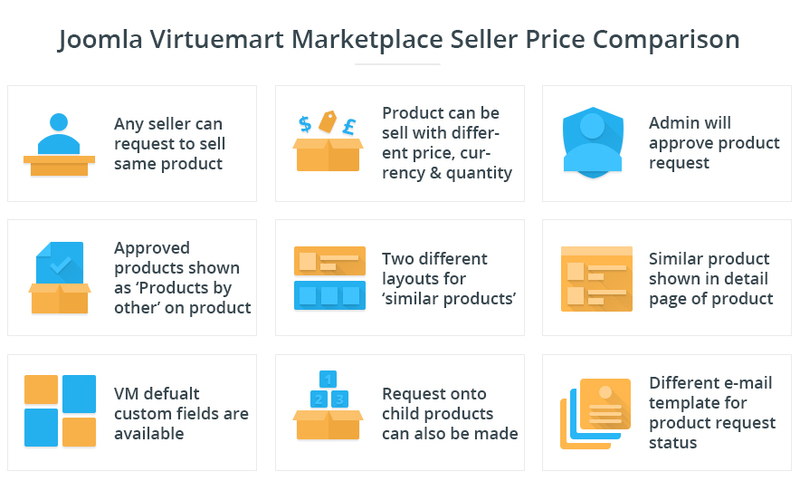 Joomla Virtuemart Marketplace Seller Price Comparison: Joomla Virtuemart marketplace Seller Price Comparison is a Virtuemart Marketplace addon which is most demanded addon nowadays for online marketplace business. 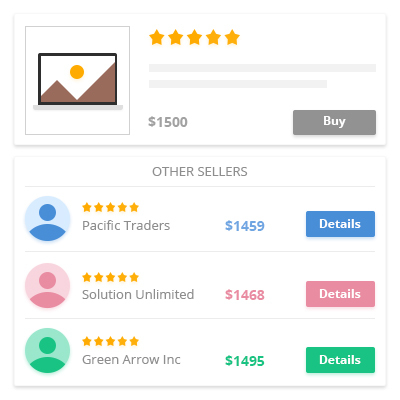 This addon allows your shoppers to see the prices offered by different sellers for the same product. Different sellers can sell the same product at their own rate, such feature increase the traffic on the Marketplace because shoppers will have an option to compare the price of the same product offered by different sellers. Also, such price comparison feature on a Marketplace stimulates competitive environment among the sellers, thus the probability of sale/Conversion will increase. Admin has rights to approve/disapprove same product request. If the admin finds any duplicate product listed by a different seller(s), they can map similar product on their own. Admin can set different email templates for product request to admin, product request confirmation to the requester, product request approval, and product request denied. Approved products will be shown as 'Products by other sellers', with 'product details' option on the product details page of the base product, with the help of module. Module to show similar products is provided with 2 different layouts options which can be selected as per preference by admin. The only base product will show listed on store directly, while similar products will be available on base product's detail page and via a direct link to their details page. Virtuemart defaults custom fields(if any) will also be available for the similar product. Request onto a child product can also be made by a seller. Any seller can request to sale same product. A seller can choose a different cost price, currency and quantity of that product. Did you buy Joomla Virtuemart Marketplace Seller Price Comparison?